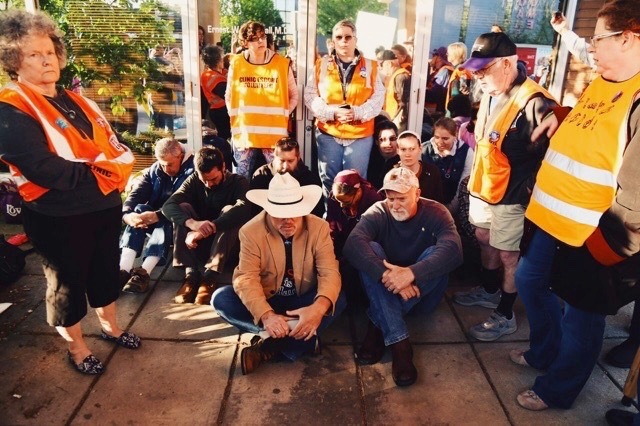 On Saturday, May 13th, 2017 eleven prayerful Christians sat down and blocked the entrance to Kentucky’s last remaining surgical abortion clinic. An 82 year old concentration camp survivor, a former pastor, a pro-life missionary and father of eight, a reverend, a veteran overseas missionary, and a humble teenage girl wearing a skirt and head covering were among those who interposed between an abortionist and his intended victims—pre-born children scheduled to be murdered. They were subsequently arrested. I was one of them. The decision to interpose in this way was not impulsive or easy to make. It was the culmination of years of agonizing prayer and wrestling in my mind and spirit as to how to obey the Lord and truly love my neighbor. I am aware that some of you who have so faithfully prayed for and supported the work of Living Hope may not understand what I did or why I did it. Therefore, I thought it proper to share, after much reflection, the reasoning that led me to this action. I have done many things in my life that I am ashamed of. Getting arrested is not one of them. Neither is it something that I am particularly proud of. Rather, in retrospect, I realize it was the inevitable outcome of an awakened conscience—a conscience informed by science, bound by logic, constrained by the righteous commands of Scripture, and inspired by the heroes of the Faith. This growing conviction of conscience, animated by the Holy Spirit, set my will on a collision course to confront in a direct and biblical way the monstrous evil of our age—abortion. Abortion is murder and we, the American, born-again, Bible-believing church, have largely acquiesced in the face of this evil. We tolerate the shedding of innocent blood, and it should not be so. I have reluctantly come to this conclusion through many years of inquiry and meditation, of experience and reflection, of agony and suffering. That said, it seems a nearly impossible task to offer up the myriad reasons why the above statement is true. Nevertheless, I will attempt to present, in this brief space, a basic foundation for this claim, categorized into four areas: Science, Logic, Scripture, and History. It is my hope not merely to offer a defense for my actions but, more importantly, that your conscience might be roused and you will earnestly seek God’s face as to your place in this battle—a battle for the lives of our pre-born neighbors, the souls of our countrymen, and the very future of our blood stained nation, staggering under the weight of guilt. “Global warming is settled science.” Have you ever heard this or a similar statement before? It seems hard to imagine that anyone has not. Whether or not there is any validity to the theory that is being so fervently trumpeted I will not address. I will set aside the multitude of offenses against common sense that this theory, and the manner in which it is championed, commits and will highlight just one. Is it not unparalleled hubris to claim to have deciphered the unfathomably complex systems at work, not only on our planet and in its atmosphere but in a star that is burning 93 million miles from the nearest scientist? (Seriously, my local weather man can’t even say with certainty if it will rain today—a 30% chance of showers, it seems.) Okay, I admit, I have some doubts. Do you want some real “settled science”? A topic about which there is no doubt? Here it is: human life begins at fertilization. That’s right, the science is settled—the fact is irrefutable. That miraculous moment when your father’s spermatozoon met your mother’s ovum, you began. There was a time when you were not. And then you were! In that one moment your human life began. You were never a goldfish or a dog or “potential human life.” You may have been given many names as you grew, names like embryo, zygote, fetus, newborn, toddler, teenager, adult, senior, but you have always been you. Check out any embryology textbook in use at any medical school in the nation and this is what you will find. Here, I’ve made it easy, just follow this link to read 41 quotes from medical textbooks that prove human life begins at fertilization. This is a fact that informs my conscience: Human life begins at fertilization. Many years ago as a young man, before I came to faith in Christ, I was searching for truth. I must admit that I looked in many of the wrong places. Still, one thing that I realized early on was that truth, by its very definition, can withstand all examination. In other words, if I sincerely desire to know truth, I need not fear holding every idea up to the light and must be willing to subject it to scrutiny from every angle. If it is indeed true, it will suffer no loss, but rather shine forth all the more radiantly for having been tested. This is the approach that I took and still take to all truth claims: they must not violate logic. I have found nothing in the Bible or orthodox Christianity that is illogical. Quite the contrary. God is truth. In the beginning was the Word or logos (the Greek root of our word logic). Let’s apply some logic. 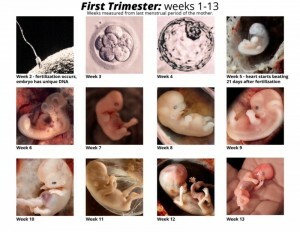 If human life begins at fertilization, it necessarily follows that every elective abortion kills a human being. To “abort,” by definition, means to stop something that is in process. In the case of abortion, that something is the life of a human being. Do you have any idea how many human beings have been killed in the time it has taken you to read this sentence? Do you realize just how privileged you are to have survived the greatest destroyer of life today? If you genuinely desire to know the answer to these questions click here. “Is abortion murder?” This is a question I have asked myself and others many times. Though there is often an uncomfortable silence, “Yes” is inevitably the answer given. Murder is defined in common law as “the killing of another human being with malice aforethought.” So, “Yes” is the right answer. Regardless of what the legal fiction known as Roe v. Wade has normalized in our society: abortion is murder. But here is where the logic breaks down. If abortion is murder, why don’t I act like a human being is actually dying? If someone were to try to harm my sweet little Julia, I have no doubt how I would react. It is convicting to realize that I do not love my neighbor as myself, or as I do my own daughter. What is hypocrisy, if not a failure to fully embrace and act upon a belief to its logical conclusion? This is a fact that binds my conscience: I believe that abortion is murder, but my conduct betrays me as a hypocrite. Let us not despair but rather place our hope in God’s sure promises. In faith, may we take courage and seek God’s grace to repent and truly love our neighbor as ourselves. This is a fact that constrains my conscience: I am my brother’s keeper. 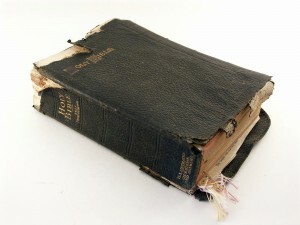 About 2,000 years ago Jesus entered a synagogue and, intending to heal a man with a withered hand, he first asked the Pharisees, “Is it lawful on the Sabbath to do good or to do harm, to save a life or to kill?” In asking this question He was revealing the true purpose of law, which is to prevent harm and save lives. Jesus healed the man, and immediately the Pharisees went out and discussed how they might destroy Him. Over 1,850 years ago Polycarp, a disciple of the Apostle John and ordained by him as the bishop of Smyrna, was on trial for refusing to burn incense to the Roman Emperor. 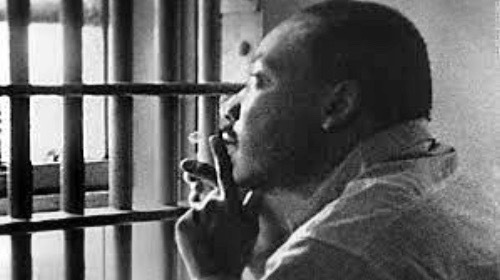 In response to his accusers’ offer to renounce Christ in exchange for his pardon he said, “Eighty and six years I have served Him, and He has done me no wrong. How then can I blaspheme my King and Savior? You threaten me with a fire that burns for a season, and after a little while is quenched; but you are ignorant of the fire of everlasting punishment that is prepared for the wicked.” He was that very day burned at the stake and pierced with a spear. The History of the people of God is replete with accounts of their many conflicts with unjust and immoral rulers and laws. Rather than tolerating the evils of their day, they simply said, “No!” and backed up their protestation by willingly laying down their lives. I believe that submission to human authority should be one of the marks of God’s people (1 Pet. 2:13-14). But submission should not be confused with obedience, they are not the same. Absolute obedience is owed to no man but to God alone. This is a great and, I fear, often forgotten part of our heritage—a heritage of fearlessly rebuking tyrants, refusing to obey ungodly decrees, and abolishing the ancient evils of slavery, human sacrifice, infanticide, the oppression of women, and other wicked practices. These are facts that should inspire us all to act, as the Holy Spirit directs, in accord with our conscience to end the greatest evil of our day—abortion.